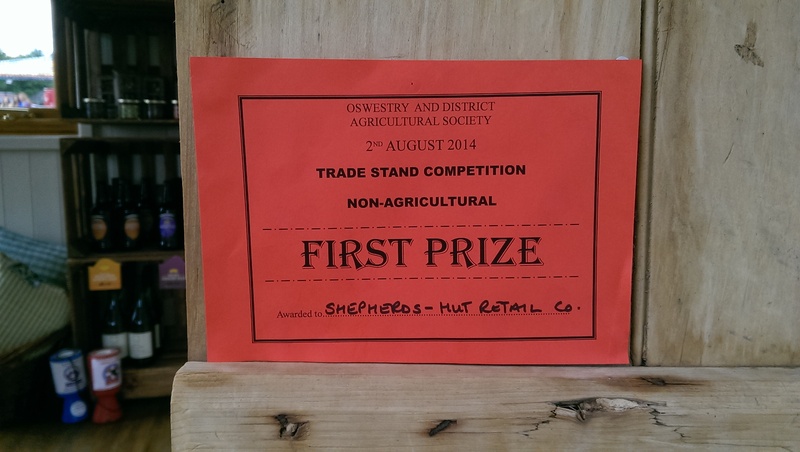 The 2nd of August was the date of the Oswestry show, which is the annual agricultural show for the County. 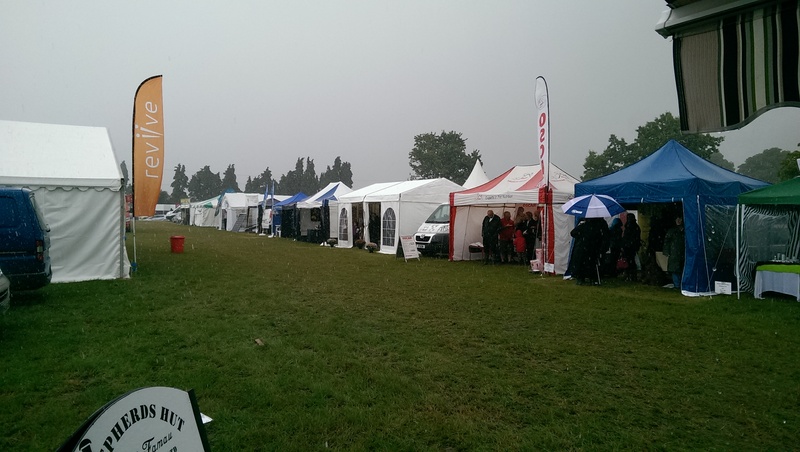 A dismal forecast was given for the show and true to the weatherman’s word the heavens opened as soon as we arrived. My duties for the day were to showcase our products In front of the Hut, attracting potential customers with offerings of free chocolate and pate. (Not to be eaten at the same time, that would be weird) With hope of the weather improving, we set up the Hut and prepared ourselves. Gradually the rain did stop the sky brightened; I poked my head from the cover of the awning, as did all the other participants of the different stalls. Cautiously tip toeing out of their tents peering up at the sky, just to be greeted with a splash of water as the rain began again. This was the theme of the weather throughout the morning, stopping and starting. Between showers, I had time to take a walk around the show, looking into other stalls and chatting to the people running them. 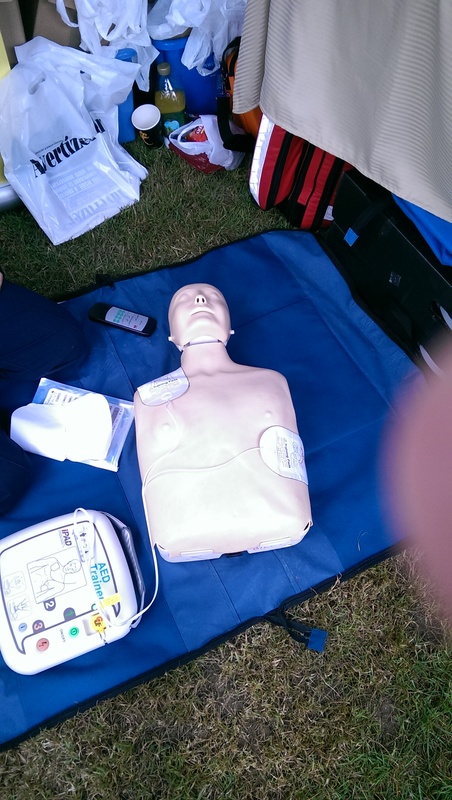 One particularly interesting stall was a local group of volunteers who were demonstrating defibrillator machines. They are being introduced in to public places from libraries, to schools to help increase the chances of heart attack sufferers. I volunteered to give the machine a go and a willing participant was needed for me to administer an electric shock. A kind gentleman by the name of Billy offered. Billy was a limbless manikin and didn’t really have any choice in the matter but that’s neither here nor there, he volunteered nonetheless. The demonstrator showed me how to check the signs and what to do if someone were having a heart attack. We went through CPR, as I was giving Billy mouth to mouth a thought occurred to me. ‘Just how many people had given Billy mouth to mouth?’ A few I imagine and pulled back only to here the demonstrator say “we generally don’t give mouth to mouth anymore.” ‘Ok why’d I have to do it then?’ Regardless of my unnecessary romantic encounter with Billy, I took some very useful information from the demonstration on what to do in such an event. In the afternoon the weather brightened up and the Sun came out. This was met with much gratefulness from everyone at the show. We had a lot of interest in the Shepherds Hut, it was turning heads and people were eager to take a closer look inside. I like to think my offerings of free chocolate helped too. As I came back from lunch I was met pleasant surprise. Julie was being awarded first prize in the trade stand competition, she was handed a silver plate for first place. The Show started to wind down in the late afternoon and people began packing up. We were still attracting visitors to the hut to have a last minute look around. I went to the car park to retrieve my car. As I was entering the car park I noticed the thick wet mud that had accumulated throughout the day, thanks to all the rain and tractors that had driven over it. This probably didn’t deem a problem to most attendants of the show as they came in 4×4s and tractors. In my corner is a 1.2 Renault Clio, challenge accepted. I skidded my way through the car park, mud flying through the air and eventually got stuck where the mud was most thick. By this time a few spectators had gathered around, one gentleman cheering me on. With the man’s (slightly drunk) cheers of motivation on my side, I put my foot down and jolted out of the mud. This was met with one final cheer from the chap, I turned to him and gave him a thumbs up which he did back to me as if to say good show friend, good show.